No proper name as such, but confirmation thanks to Vinny Mainolfi, that John Twiddy was working on yet another game for the C64, which was mentioned when interviewed in Zzap 64. In the interview, John mentions that he was working on his own take on Marble Madness, but we were never to see any Marble Madness clone with his name attatched to it. So just what happened to this game?… Who was to release it? 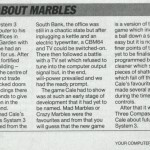 Well, thanks to Andrew Fisher, we find that it was actually meant to be System 3… In a news piece for Your Computer in March 1986, Mark Cale demonstrated a new System 3 game – to be called Mad Marbles or Crazy Marbles. The obvious inspiration from the description was the arcade game Marble Madness, which got an official conversion thanks to Electronic Arts. But what happened to Cale’s game? Was this another unfinished System 3 project, or does something still exist? We need to ask John Twiddy to find out more, but unfortunately he has been very busy lately.